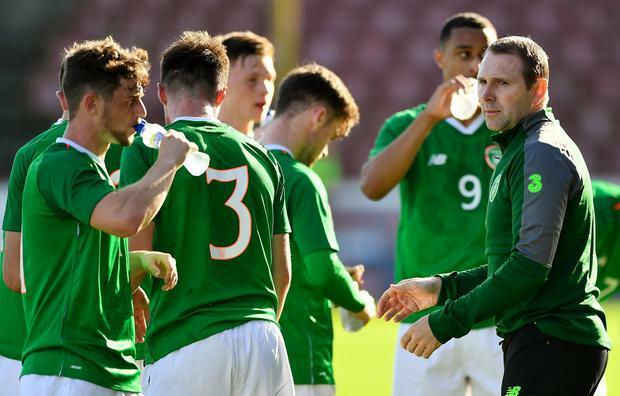 Ireland's U-19s must trek to Russia in March to negotiate the last hurdle of a qualifying campaign that could see them reach a first European Championship finals for eight years. Nine points taken from their three preliminary stage qualifiers in October, including victory over U-17 champions Holland, earned Tom Mohan's side a top seeding in yesterday's draw in Nyon. They were drawn with one other group winner, Russia, and two runners-up, Azerbaijan and Romania, with only the top team progressing to the showpiece in Armenia next July. Russia's offer to host the mini-group was accepted by UEFA following the draw. Their manager, Andrei Gordeev, expressed his delighted at having home advantage, declaring it could prove decisive in the games on March 20, 23 and 26. They topped their first phase group on seven points with 2-0 wins over Montenegro and Cyprus along with a 1-1 draw against Latvia. Ireland will also travel with high expectations, this panel being an amalgam of the two last U-17 squads that reached the knockout stages of consecutive European Championship finals. Mohan is particularly blessed with an abundance of options in attack. Adam Idah, Glen McAuley and rising star Troy Parrott supplied the firepower for the qualifiers but Brighton's Aaron Connolly and Ryan Cassidy of Watford are in contention after good form at club level. Parrott, still just 16, is pushing to be included in the first squad announced by new Ireland U-21 manager Stephen Kenny for their opening Euro qualifier that same week. Tottenham will only allow their Dubliner feature for one of the squads in the same window. Kenny will discover his opposition next Tuesday when the draw for the Euro 2021 qualifying campaign is made. Ireland will once again be fourth seeds and only the group victor is guaranteed a place at the finals in Slovenia and Hungary. Also drawn out yesterday were the groups for next season's first phase qualifiers, from which two teams advance to the elite stage. Ireland's U-19s will be in with Austria, Switzerland and Gibraltar while the U-17s host their mini-group featuring Israel, Montenegro and Andorra. This season's U-17s have no qualifying matches as the FAI are staging the finals in May. Elsewhere, former Ireland international Damien Delaney has prematurely ended his second stint at Cork City after it was agreed to cancel the defender's contract after just five months. Shane Griffin has renewed his deal at Turner's Cross.